A hot and sticky (yes, it can get humid in San Tan Valley, Arizona) July summer day. 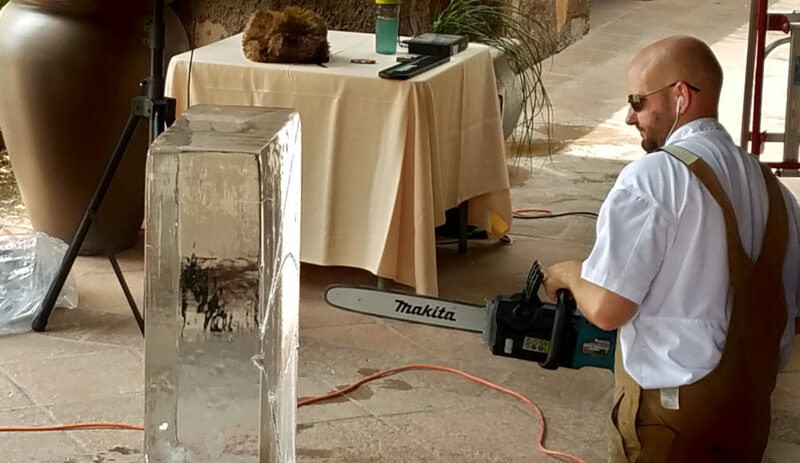 Executive Sous Chef Josh Nylin of Encanterra Community Resort demonstrated his chainsaw skills by transforming a 300lbs block of ice into a fish with coral ice sculpture. It is sharp and can hurt if you are impelled by the teeth side of it. As you can see, Chef Josh is wearing protective gear, eye protection, ear protection and leather coveralls. 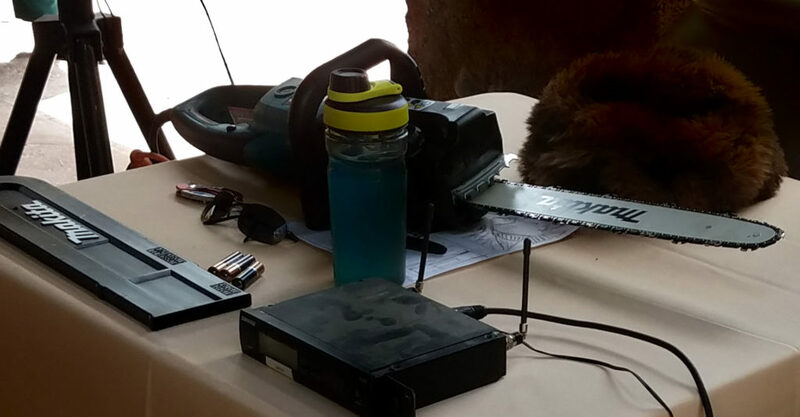 He likes to use an electric chainsaw because he has more control over the speed and it is less noisy. You could duck when ice is propelled toward you or hide behind another person. The ice really does not fly through the air. The event coordinators had the first row of seats about 5 feet away. Can you believe it? 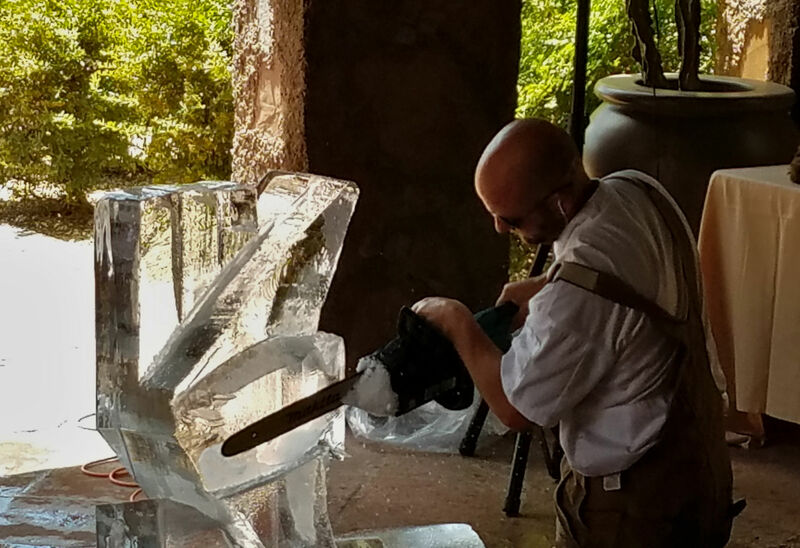 Chef Josh turned the 300lbs block of ice into this amazing sculpture that is a functioning ice sculpture luge. The facility will be refreezing the ice sculpture. 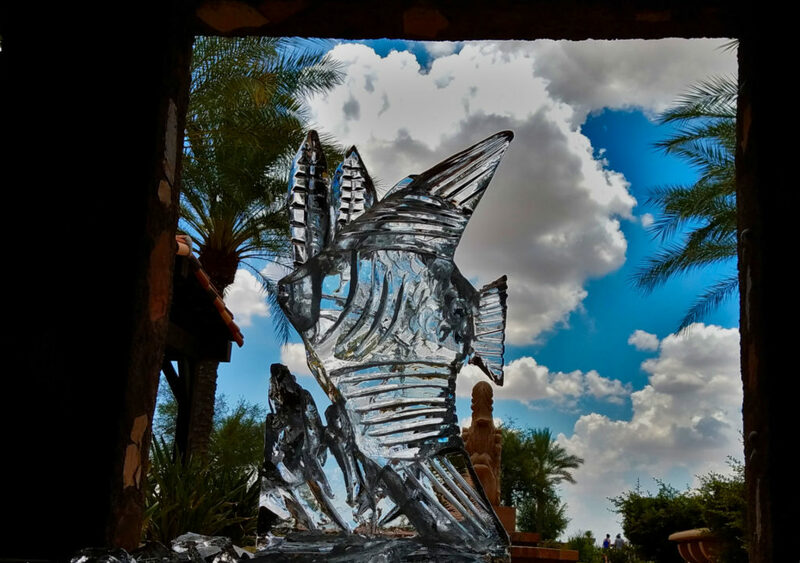 Then bring it back out for this evening social hour and pouring blue margaritas down the ice sculpture luge. What a wonderful date idea. 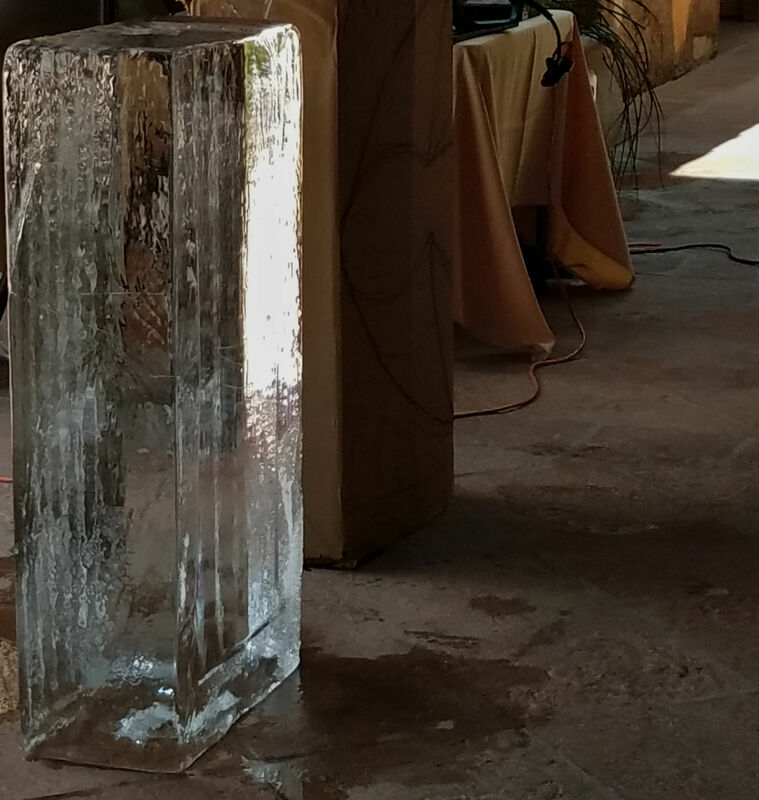 We had a great time watching Chef Josh bring to life a block of ice. Have you ever had a drink from a luge? If yes, what was the occasion? Wow! That’s really cool! I would love to see that in person! Thanks for sharing! It is a different experience when you are in person. You would like it. I would be afraid to get close to them. They r so gorgeous, but I would trip & knock it over! Josh is such a talented man. Great tips!! So awesome to watch this in person. Loving your blog!! Keep up the great work. I enjoy reading from your perspective. The talent of someone to turn ice into a sculpture is amazing. Wow! So cool to watch! I’ve actually never even seen this process, so cool!! So cool – we went to an amazing ice sculpture festival in Michigan once – it was so incredibly neat. There was a full-size photo booth, a putting green, and many life-size statutes. That sounds like a wonderful event. Whoa! I’ll bet the flying ice chips can be intense! The finished product is so beautiful that it looks like something made from glass. I agree it does look like glass. 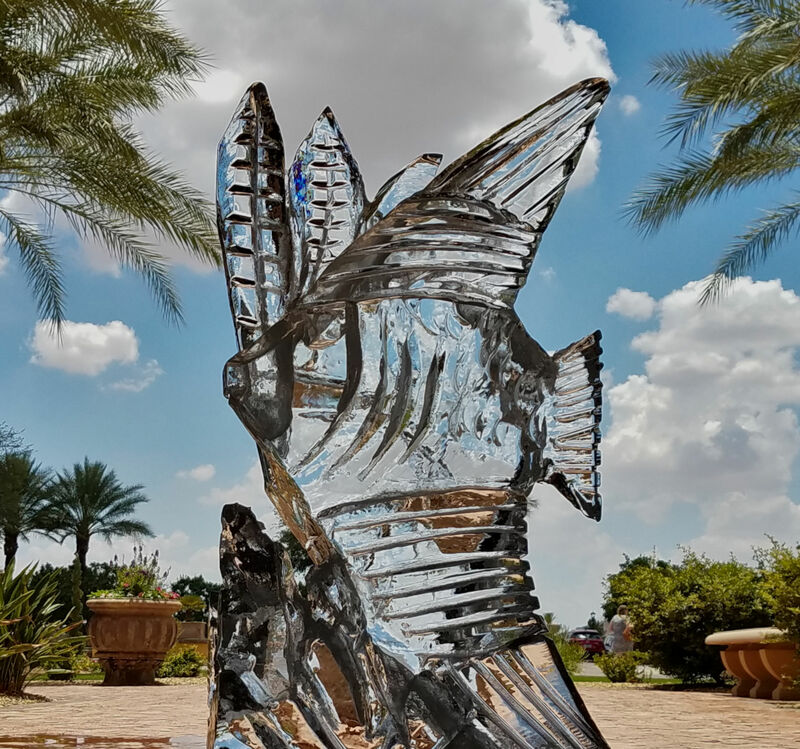 Wow, an ice event in Arizona! That must have been impressive and contrast with the warm weather! After the event, there were a few people who picked up the smaller extra ice parts and used them the cool off on their skin. That looks like a lot of fun! I don’t think many people think of how far the ice can fly when it is shaved off, so that’s a great tip. This is so cool! Thanks for the tips!